Credit card issuers in the United States are moving to a new credit card system for fighting fraud and are gradually migrating all of their customers to the new technology each time the consumer renews their cards. 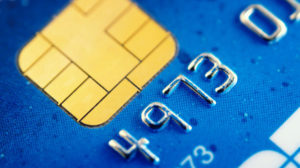 Each new credit card will have an embedded computer chip that can store and process data more securely. Your new credit card looks exactly the same with two differences. First there is a new marking on the card. Usually on the left hand side that looks like a small computer chip printed circuit board. This is the brains of the card. It contains all of your information including your pin number. The second major difference is a symbol on the right hand side of the card which looks like a series of ))). This signifies that you can swipe your card against a reader for faster processing. The chip is embedded in the plastic of the card. As a result this makes it harder to duplicate your information and produce a new card. It also increases the security when you make your purchase as well. Each time you use your card you personally must ok the expenditure. Also you must enter your pin number to approve the charge. This is a great step forward and increases security and reduces fraud. We are not so sure about the second feature of these cards. Swipe Function On Your Credit Card. As we mentioned earlier, the second major difference is a symbol on the right hand side of the card. Which looks like a series of ))). It signifies that you can swipe your card against a reader for faster processing. Any credit card terminal that displays the same symbol can be used to approve an expenditure. All you need to do is wave your card within an inch of the terminal. Hence it is certainly fast and convenient but how safe is it in terms of fraud. Imagine if your card is stolen. All the thief has to do is go to places with this symbol. They pass your card in front to purchase goods. There is probably a limit to how much you can purchase this way. Still, it is another way to have fraudulent expenses billed to your account based on this process. We have even heard of thieves walking down a crowded street with a reader. They are passing it close to women’s purses and men’s back pocket were their wallet is typically carried. They just get it close to the wallet and the information is transferred. Now you can purchase using a fraudulent terminal. We know that the security people are concerned about this issue. However we do not know what they are doing about it or even how serious it might be in terms of fraud. However we know that there are some very smart thieves out there. They will probably think of a way to get away with it. Bottom line, even with this increased security, consumers must still be careful with their credit cards to protect themselves. Never leave your wallet somewhere were it can be stolen or scanned. Always carry your wallet or purse in front of you were you have some control over who is close to you. Leave comments about this subject and about ways you can protect your self from fraudulent card use. If you want us to post your comment it should be something that helps our readers with this subjective.